Malbec is from Argentina, Carmenere is from Chile, and Shiraz is from Australia. Oh, New Zealand makes good Sauvignon Blanc, and South Africa produces a brooding wine you can’t find anywhere else called Pinotage. 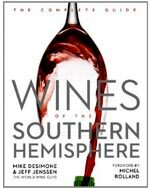 What more do you need to know about wines from the Southern Hemisphere?